I'm in. I'll pick it up on VC once I'm done with Radiant Dawn. Man. You're an awesome guy, has anyone told you that recently? Thumbs up, brother. --What other games do you want to see in the future? (This is not up for debate NOW, haha!!) I know there has been talk of..man, I'm hesitant to even mention anything now as it can cause unrest.. Anyway, Skies, Tales, Secrets, Illusions, Fantasies, Stories, etc. 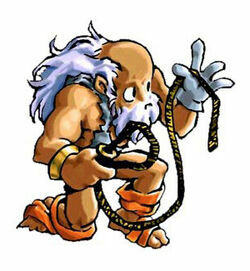 I'd actually like to play through and beat Final Fantasy on NES with a guided hand sometime. I don't even know if I've ever even had "adult" characters in that game. I always get stuck somewhere and trail off. 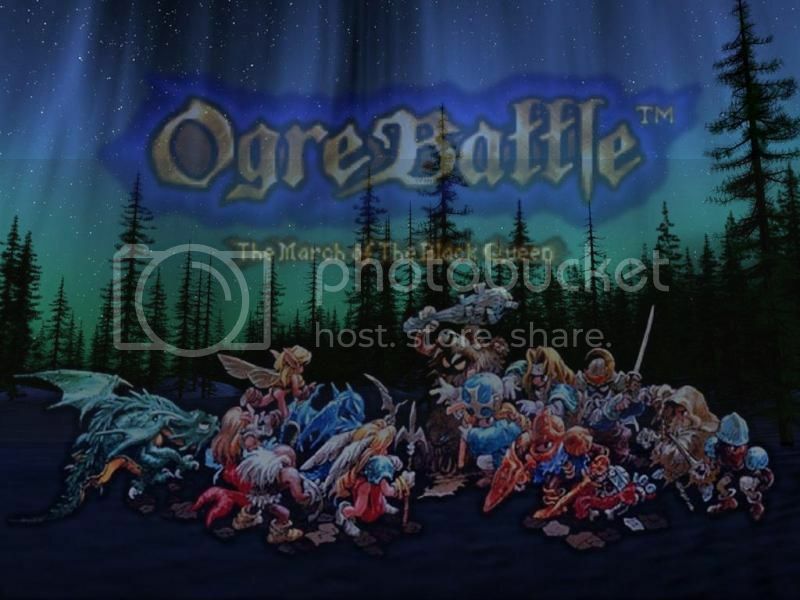 Ogre Battle is one of my favorite series' of all-time in all aspects, and it just paved a way for me where I would look for the same types of things that I experienced in this game, in other games. I wasn't a fan of RPGs on the NES until I had already dealt with SNES games (as far as I can tell; I know that I returned Faxanadu one time..I'm fine with it now, haha), and this one certainly did its job. I first met with it on a rental from Wegman's way back when, my mom double checking to make sure I actually wanted 'that' game since it didn't look like something I'd enjoy. But it spoke to me. We used to go weekly to grab a new game, and I never really said anything about it after. I do remember with that one though (and later with Final Fantasy III), I specifically went and sat on the couch next to her (after playing for a lengthy time) and told her just how much I appreciated the rental. I wasn't an unappreciative kid by any means, but I remember going out of my way to say thank you again. A game that special, striking the heart of a young boy and capturing his attention, should be experienced by a wide array of folks. Sadly, it has not. At press time, Negative World has but 4 (FOUR) ratings for Ogre Battle in the NW Database, and just 6 (SIX) owners. I went over to howlongtobeat.com last night so I could give an accurate time to some of our Ogre Battle combatants..and nobody over there has beaten it. I'd ask people about Ogre Battle Club, and they'd tell me "nah, not really into Tactics games" or "I don't have time for Ogre Battle 64," and then I realized that some people might have no idea what I'm talking about at all. This is NOT a Tactics game. This is NOT Ogre Battle 64. This is OGRE BATTLE: MARCH OF THE BLACK QUEEN, the game that started it all. We disembark on the the first Sunday of January (you don't have to start ON Sunday), the 6th at the stroke of midnight on the 5th. This will be run in the fashion of Okami Club / Fire Emblem Club with a series of checkpoints to hit through the course of your week. Burn through it in one night night, nibble away at it through the week, whatever you want to do, really. Just be sure (if you fall behind, its fine..and we can slow down if you need it) to have your stuff done by Saturday at the end of the week. I can promise you that it will NOT overwhelm you, and it is certainly not as time-consuming as either of the previous Clubs, and it won't be nearly as unforgiving as Fire Emblem. If you have to repeat a course for some reason, something definitely went wrong somewhere, haha. A brief overview of Ogre Battle. It is a Strategy RPG where you control an army of characters. Within this army is groups, formed by you, consisting of 5 (or less) characters. Large characters count as 2. The game consists of your stereotypical Fantasy classes; knights, wizards, dragons, wyms, griffons, imps, giants, etc. They gain experience points, and levels, and can change class at a certain point. The battles are automated, but depending on where you set them up in their group, they perform a certain attack, a certain number of times. You'll encounter enemy groups on each map similar to your army, and whoever deals the most damage wins the battle. The loser is bounced back, but will return until they are obliterated. You Liberate / Capture towns through your adventure, earning money along the way. Liberation will raise your reputation, a meter that is paramount to receiving one of THIRTEEN possible endings. You can't really mess up this game, so don't worry about that. If a character dies, you can simply revive them at a Temple, or just wait until the chapter ends. No permadeath here. We'll get into the meat and potatoes of it as we progress, I expect this first game to take about EIGHT WEEKS before we move onto our next game, but that could change on the speed at which we're completing stages, for better or worse. I would be overjoyed with a great turnout in this one, but after the 3-man sprint to the finish in Fire Emblem, morale is not high (Morale! Another important Ogre Battle feature!). We've got a few set for this initially, when you toss your hat into the ring, we'll get you on there, too. Please post any and all questions, you have, and YES, this will be THE place for future RPG Club stuff. I'm still hanging out for Tales some time in the Future. Skies if it ever gets a digital re-release. Hmm, what is the difference between a strategy and tactics game? Alright alright, sign me up. But I can't guarantee that I will progress at the rate you need, I have a lot on my plate right now. --The Tactics games are grid-based, I believe, and they really turn me off for some reason. (But I loved the heck out of Fire Emblem, go figure.) I don't know EXACTLY how the Tactics games work, but this one isn't turn-based. Everyone kinda moves at the same time, though different Units progress at different speeds based on their movement type. Liiiike, a group carried by a huge Griffon will move much faster than dragging an Octopus through the mountains. And I feel like the Tactics battles are like 1-on-1 or "A attacks B" and that ends that turn? These are 5 on 5 affairs, which each side getting to fight. You may NOT attack someone without them having a chance to return attack (think "using a bow against someone who can't fight back"), unless, of course, you kill them. I would do this but, I don't own a Wii. My Mum does. And you can't buy VC games on Wii U through the Wii mode right? Pretty sure you can but I don't believe you can gift/receive gifts. Awesome so I'll definitely do this. May take me a little longer to pay off a game I'm getting but never mind. I think V basically told you you CAN'T do that. How are you going to get it? If it matters at all, you can obviously play on cartridge on the SNES, and I know it also re-released on Playstation. How are you going to get the game, dude? EDIT- Oh, he's saying you can use the Wii Shop while in Wii Mode? Is that confirmed?? Are you gonna tear it up, too, V? I'm not much of a RPG fan. I do own a few RPGs that I haven't put much time into Final Fantasy II (US) and Chrono Trigger are the the more well known ones. I am more interested in strategy games though, so that would spark my interest more. Yeah he said I can. I could always track down the cartridge, I do have a SNES. How much is the cartridge normally? Not sure how many more Strategy-RPGs we have out there. Not many..right? At least not "classics." Most of 'em are "J"RPGs, yes? Lemme check eBay (though it'll be different for you, of course). --Wow, too expensive. $90 US, somehow?? Apparently these people are blissfully unaware of the Virtual Console. SNES cartridges are normally expensive. Same with NES and 64 carts. Since you asked so nicely I might as well join along. Eh, I dunno. I just did a grab bag thing where you could get anything for 8 bucks (randomly). I got Super Empire Strikes Back. Good stuff! Or maybe you mean that stuff is extra expensive for you guys? I ordered Illusion of Gaia less than a year ago for around 15 dollars including shipping? Wasn't too bad at all. You're a gentleman, and a scholar-- and a daily inspiration to us all. Thats what you call a three-for. Welcome! How many weeks do you expect it to run? I guessed somewhere between 6 and 10. I'm pretty sure it'll DEFINITELY be between there. Depends on how fast we want to work, and how much work we want to do. -I- can handle 6 Weeks on it, and be fine, not sure if other people can. Remember, we'll be going at the same pace (more or less), so we gotta move with the group. If one or two people are laggin' though..they gotta pick it up! Know what I mean? First week'll be pretty light. 2nd week will be the true test. And if that is "just right" or "too much," we'll adjust accordingly. I've looked ahead at some stuff, and it looked like 8 weeks is probably a pretty good number, though there are some optional "best ending" stages that you need to complete, too, which will be truly EXTRA work for people going into that, and WILL NOT affect the people who choose NOT to do those stages. Does that work? You can't NOT beat the game, I think. Heck, as a kid I never even new about those places, I just ran into them the last time I played. I'm totally stoked for this game, brah. So very rewarding when you peg your Reputation Meter to the ceiling. Okay, I'm definitely interested, and I did get this on VC, but I have already failed at Backlaugust and NewGameber. I'm not so good at the finishing of the games. I don't think I should dare to disappoint again. Haha, why DO you fail on those other things? Is it so hard? Maybe those ones were harder for you because you didn't have someone -telling- you exactly what to do each week? How does the format of Fire Emblem Club suit you? "Finish this stage. Beat that stage. Beat that stage," and then you're done for a whole calendar week? No good? I guess Mrs_Mustache isn't going to play. One of my dreams, to play Ogre Battle side-by-side (literally) with her will not come to fruition. Ogre Battle Gift from years ago: huge waste of money and excitement. Forever, will remain, "to do," in the NW Database. Schlonnnnnk.